Run according to demand, with a minimum of one and a maximum of three attendees. You may wish to attend on your own, with a friend or family member, or book your own activity day for a birthday outing or alternative hen weekend! A fun and intensive day learning the basic techniques of jewellery and silversmithing. Small class sizes mean that you can have as much hands-on support and guidance as you need, have a wonderful creative experience, and come away with jewellery you are thrilled with. The workshop is suitable for absolute beginners and also those with a little prior experience. Very much bespoke in flavour, our classes are relaxed and informative, are designed to be creatively freeing, and have no rigidly prescribed outcome. For example, if you want to spend the day making a simple set of silver stacking rings, you can... or if you'd rather try your hand at an elegant bangle or learn how to make a handmade chain, you can... if you're hoping to come away with a pierced-work pendant or a pair of drop earrings, that's fine! It's entirely up to you what you'd like to make. You may wish to bring some designs or sketches for a couple of simple ideas with you to the class as a starting point. Although the studio is always warm and cosy, we recommend dressing comfortably and practically. The day runs from 10am and finishes around 4pm, with a break for lunch. Please note that we have a dog (a friendly, quiet rescue greyhound) who comes into to the studio with us, and also a white rescue cat who likes to hang out occasionally. Please be aware of this if you have allergies! One day sterling silver workshops are £130 per person + materials. Material costs are extra and are payable on the day. We keep a varied supply of sterling silver sheet, wire and ready-made findings in stock. 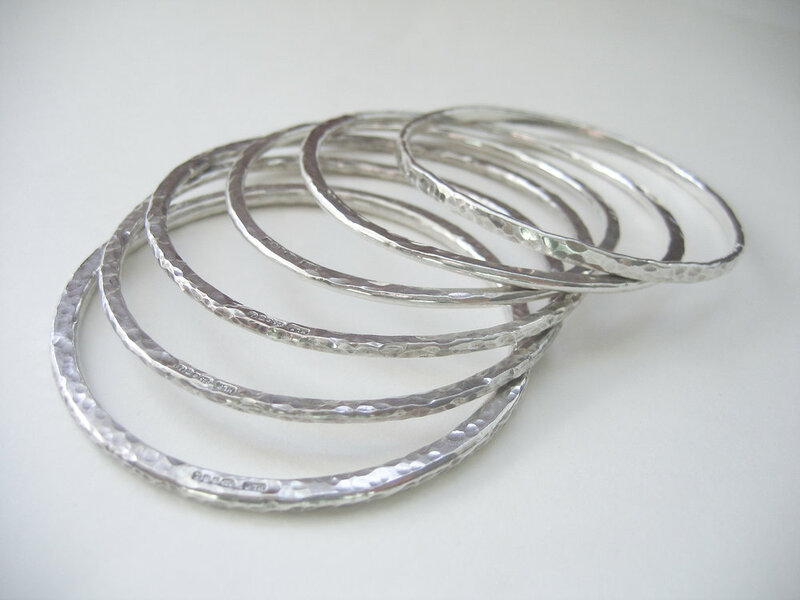 Material costs for sterling silver vary from around £5 to £40, depending on what you make and how much you use. One day 9ct gold workshops are £170 per person + materials. Material costs are extra and are payable in advance of the day. We don’t keep any gold in stock, but liaise with you in advance of your workshop before ordering it in especially, according to what you would like to make. Material costs for 9ct gold can vary from around £60 - £200 depending on what you would like to make. We will be working with sterling silver sheet, wire and chain to learn fundamental techniques of jewellery-making and silversmithing; including forming, forging, soldering, finishing and basic setting. A two-day weekend course, suitable for beginners and also those with a little prior experience.